Cave Mt. Ranch offers a unique hunting experience. Although there is a high fence the deer are free ranging in the hunting area and as the deer are wild this offers a unique challenge for the hunter. We have permanent stands, building blinds, tree stands, etc. and hunters are allowed to use their own tree stands. These hunts are semi-guided and we will make every effort to put you in the best location to succeed. These are three day all inclusive hunts. We guarantee you the opportunity to take at least a 130 plus buck and have had several in 190 plus, with a 100% success since 1999 with the average buck taken being 160 plus. Purchase of a hunt entitles the hunter to use his weapon of choice to take one buck only and understands he or she is responsible for injury to any other animals. As these are our most popular hunts and there are no trophy fees – these sell out early. Cave Mt. Ranch also offers guaranteed trophy hunts priced according to score. 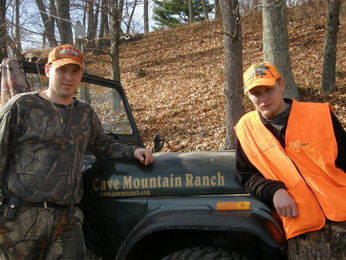 These hunts include a one night and one day stay at Cave Mt. Ranch Lodge. All hunts include caping and skinning of your trophy whitetail deer.